You know you're getting older when you choose comfort over any semblance of style - as this coat shows. I'm actually doing this coat a disservice by calling it hideous. Saying it's not in the least bit stylish is unfair, too. It's just that it's something I never thought I'd buy - and something I've no regrets buying. There are plenty of coats I do regret buying and the main reason for that regret, for the most part, was that they were too trendy. They had specific features, like leather arms, for instance, that made them SO outdated the next season after and after and after that. I still wear them because I can't bear to be that wasteful but this new year, I realised I needed a proper big padded jacket-coat. Everyone needs one. Discover where to get the €50 version of the coat everyone's wearing. I discovered I needed it while in Pamela Scott on Grafton Street looking at formal wear. I didn't find anything downstairs but on my way back up, this is what was facing me. Oh, yes, I'm fully away it's a middle-aged lady with teenage kids and at her wit's end kind of coat. Nothing wrong with that persona, obviously, but I'm not her. Still, I tried it on in multiple colours, decided that that shiny grey was the one for me and bought it. I got it two sizes too big, too, so it's extra big and cosy. It's so very warm, but it's light. Perfect for standing on the sidelines when watching the rugby or going for a bracing walk, or whatever proper adults do. I'll be wearing it with leggings and white runners and using it to take me safe and warmly to day-drinks on a Sunday. Stranger Things actress Natalya Dyer wore something similar at Sundance last week...so maybe it actually is cool? Are you a padded jacket fan? 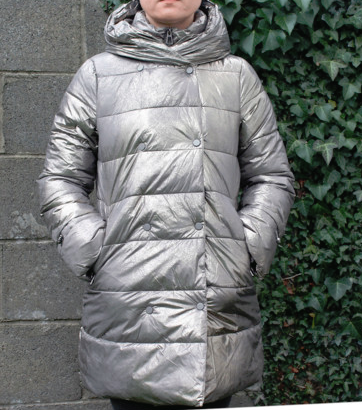 Or are you still at the stage where you'd rather freeze than wear a shiny grey padded mom coat?